Yesterday was my first BBQ since eating healthy. It was also a big bump in the road. I do not know what I was thinking! Was I really expecting to have my host lay out a feast to fit the Goddess? Seriously! Hello, the Goddess is in the house, all hail the Goddess! Talk about conceit, Geez. Honestly, the thought did cross my mind, briefly, what am I going to eat? But I knew my host was having meat for sure, so I thought I am good. HA! 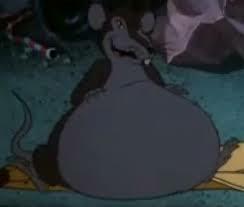 Big fat HA! Most of the BBQs that I go to have people bring a dish to pass. No biggie. Food is expensive. I just figured I am sure there will be a veggie tray, salads, I don't have to eat the dressings, Oh I bet someone will bring a fruit bowl. Again, HA! My first mistake, (ugh) was I did not eat something before we left. I do that sometimes. I get myself involved in things the first thing in the day and do not feed my body. I am working on that. Plus, somewhere along the line I have created a horrible habit of thinking "Oh, it is a party" or "Oh, it is a holiday" I better save my eating for then. Am I the only one who does this? Stinking Thinking! Well this was the case. Remember I said I "briefly"thought what am I going to eat? Brief, well more like a split second before I went into old thoughts. We arrive to food. Not just food, but comfort food! I am talking Lemon cake, my Aunt's homemade Vanilla cake with homemade butter chocolate frosting, Herb homemade rolls, Lay's Potato chips, pasta salad, Baked beans, fresh corn on the cob, fruit salad with whipped cream and get this, caramel and toffee bits topped on it. But last but not least Homemade Mac-n-Cheese. A smorgasbord of gluttony. Oh, and there was a veggie tray. I was in deep trouble. Immediately my body, already starving went into accelerated over load. FOOD! Immediately I went to the veggie tray and got a hamburger. But gosh, that Mac-n-Cheese, it is straight out of heaven, I could tell. Needless to say, my "Human" won. By the time I left the party 3 hours later, I looked like Templeton the Rat, from the book and movie "Charlotte's Web." You know after he goes to the fair and eats everything in sight. Me after the party! You are singing the song now too huh? Seriously I was a bloated miserable mess! However, I now take any experience, good or bad and learn from it. So what would I do differently? How can I make social eating situations enjoyable without damaging my health? 1. Eat! Regardless of my day, make fueling my body a top priority. I am no good to anyone if I am not fueled. 2. Find out if possible from the host what is being served. Prepare. Share with the host your healthy eating. I am a bit uncomfortable about this, despite my previous conceit from above. I would hate to put someone out. But would it be different if someone in my family had a extreme food allergy? I would notify the host. 3. Bring a dish to pass that I know I can eat. Maybe even two! A salad with chicken and veggies, a fruit bowl or a savory Paleo/Whole 30 approved goodie. 4. Host a party yourself and share the health! 5. If and obviously When I fall off the healthy eating "horse," Pick your self up and continue on. Don't fall into beating yourself up, learn from it, and go forward. That is exactly what I did today! Today a new day.Breakfast was simple. Banana and some almonds, I was not feeling super hungry. However, here are two meals I ate today and I even got all my food prep finished for the week. 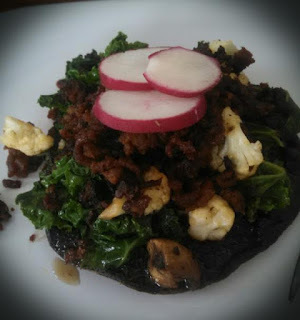 Portabella Mushroom Cap topped with sauteed white mushrooms, Cauliflower and Kale and Chorizo, with Radish. Easy to do! First cook the Chorizo. Set aside. I always drain it on a paper towel. Helps cut the grease factor down. I then added some coconut oil to the same pan and cooked the Mushroom cap until slightly soft. Remove Mushroom cap. I then added the white mushrooms, cauliflower and garlic to pan. Cooked until tender. Then I added the Kale. I cook my veggies until just tender. No wimpy veggies here! Top Mushroom cap with vegetables, chorizo and a few radishes. Totally did this in the crock pot. Had found a great deal on Chicken Thighs so I used them. I removed the meat. The skin and bones went into my stock pot to make a huge batch of bone broth. Which I froze for later. I love to cook and love to add spices and such for a great dish. This was basically my thought on this meal. I had a Mango that was desperately in need to be used. After I trimmed the meat, I put it into the crock pot, added the mango, about 3 Tbsp of Coconut oil, fresh basil leaves, 1 tsp of cilantro, 1 tsp. of Allspice, 1 tsp. of Curry, 1 tsp of garlic, Himalayan Salt and pepper. I just put it all in the crock pot, combined and set it on for 6 hours. About 45 minutes before I knew that the chicken would be done, I peeled and cut up the Sweet Potatoes, and Kohlrabi. I tossed them with Olive oil, Himalayan salt, Pepper, and Onion powder. Next I lined a baking sheet with parchment paper, evenly distributed the Potatoes and Kohlrabi. Bake at 375 for about 30 minutes or until tender. 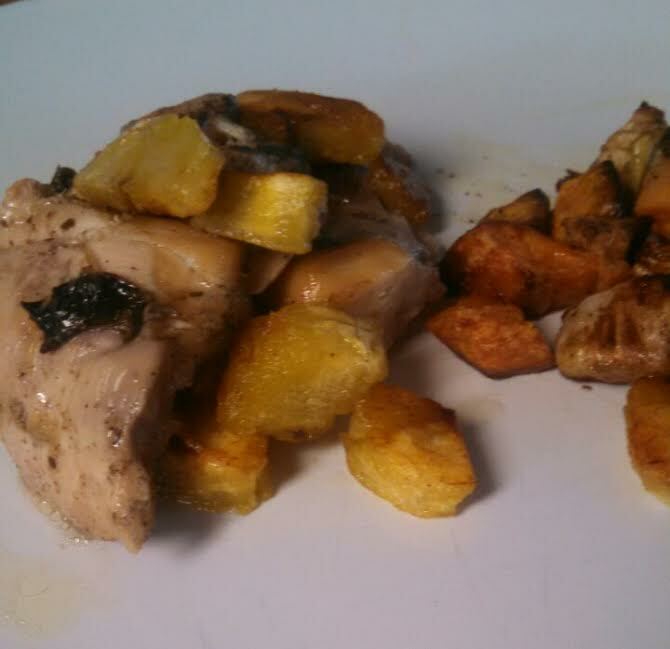 While that was baking, I sliced and sauteed 1 Plantain in Olive oil, which I topped over the chicken. The Goddess has gone Primal!